A sweeping account of the century of experimentation that confirmed Einstein's general theory of relativity, bringing to life the science and scientists at the origins of relativity, the development of radio telescopes, the discovery of black holes and quasars, and the still unresolved place of gravity in quantum theory. Albert Einstein did nothing of note on May 29, 1919, yet that is when he became immortal. On that day, astronomer Arthur Eddington and his team observed a solar eclipse and found something extraordinary: gravity bends light, just as Einstein predicted. The findings confirmed the theory of general relativity, fundamentally changing our understanding of space and time. A century later, another group of astronomers is performing a similar experiment on a much larger scale. The Event Horizon Telescope, a globe-spanning array of radio dishes, is examining space surrounding Sagittarius A*, the supermassive black hole at the center of the Milky Way. As Ron Cowen recounts, one foremost goal of the experiment is to determine whether Einstein was right on the details. Gravity lies at the heart of what we don't know about quantum mechanics, but tantalizing possibilities for deeper insight are offered by black holes. By observing starlight wrapping around Sagittarius A*, the telescope will not only provide the first direct view of an event horizon-a black hole's point of no return-but will also enable scientists to test Einstein's theory under the most extreme conditions. 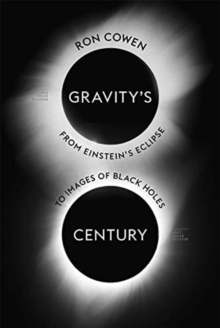 Gravity's Century shows how we got from the pivotal observations of the 1919 eclipse to the Event Horizon Telescope, and what is at stake today. Breaking down the physics in clear and approachable language, Cowen makes vivid how the quest to understand gravity is really the quest to comprehend the universe. Pages: 192 pages, 10 photos, 11 illus.